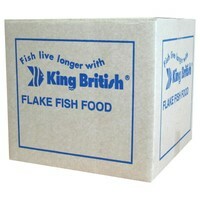 King British Tropical Fish Flake Food is made with only the finest ingredients. This high-quality fish food offers tropical fish a well-balanced meal, rich in vitamins and minerals and free from artificial colourings, flavourings and preservatives. The natural seaweed extract helps fish maintain a strong immune system and their ability to fight off infection and disease. This high protein formula creates minimal waste, leaving a safe, clean environment for your fish.